Some information may be useful - some may not. But, as the Department is well-known for altering or hiding data, an agency or rule is only as good as its implementation. Everything looks good until you try to use the information or locate someone to help you deal with your own circumstances. Every child has one shot at an excellent education. It’s up to us to make sure they get it. Let’s shape the next generation of New York’s voices and minds. Let’s transform dreamers to doers. Let’s empower students in every neighborhood on their path to success. Because we believe in every child’s future. 1. Academic Excellence: means striving to ensure every student is college- and career ready. We work to meet students’ diverse needs with a variety of in-school and afterschool programs and support front-line educators and leadership with opportunities for professional development and collaboration. 2. Student & Community Support: celebrates supporting the whole child, as well as their family, on their social and emotional journey inside and outside of the classroom. We collaborate with community partners—from elected officials to public advocates—and engage parents and families to reflect the needs of local communities. 3. Innovation: allows us to experiment with new programming and initiatives. We aim to provide schools and educators the flexibility and resources they need to meet students and families where they are. 2. Support strong teachers and a strong curriculum in every school. 3. Meet communities where they are. Striving to ensure every student is college- and career ready, we must start early and ensure all students are reading on grade level by the end of 2nd grade. Every elementary school will receive support from a dedicated reading coach. What will we see this school year? 103 reading coaches were hired during spring of 2016 and received intensive training over the summer. Schools also began preparatory work this past spring. All students will complete algebra no later than 9th grade, enabling them to reach more advanced math courses in high school and better preparing them for college and careers. By 2022, all students will have access to an algebra course in 8th grade, and to academic supports in elementary and middle school to ensure greater algebra readiness. Over 400 teachers from 5th to 10th grade will return to their classrooms across the city this September with expanded expertise in math instruction and strategies. 67 elementary schools are departmentalizing to ensure a specialized math teacher is helping students toward the goal of algebra for all. Every high school student will have access to Advanced Placement courses. New AP courses and preparatory courses will start in fall 2016, with 75 percent of students offered at least five AP classes by fall 2018. By fall 2021, students at all high schools will have access to a full slate of at least five AP classes, thereby increasing college and career readiness for all students. There will be new AP courses at 63 schools, including 35 that did not offer any last year. Teachers at these schools are also receiving rigorous, subject-specific training for all AP teachers. Through an unprecedented public-private partnership with lead partners NYC Foundation for Computer Science Education (CSNYC) and Robin Hood, by 2025, all NYC public school students will receive high quality Computer Science (CS) education at each school level: elementary, middle, and high school. Over the next 10 years, the DOE will train nearly 5,000 teachers who will bring CS education to the City’s ~1.1 million public school students. 246 elementary, middle, and schools are participating in Computer Science for All this year, including 98 offering full-year or multi-year sequences. This includes AP Computer Science Principles, the Software Engineering Program (SEP), and SEP Jr., which are full-year or multi-year sequences, and the STEM Institute, an intensive training for teachers to implement Computer Science lessons and units in their schools. Across these schools, 457 teachers are receiving rigorous professional development and support to implement these programs. Empowering students on their path to success means ensuring every middle school student will be exposed to a college-going culture and will have the opportunity to visit a college campus. The campus visit will be embedded in a broader set of student and parent workshops focused on planning for high school and college. For the 2016-17 school year, College Access for All will be implemented in over 160 middle schools in 10 districts: 5, 6, 8, 11, 14, 18, 19, 27, 29, and 31. Schools in other districts are also encouraged to continue and expand upon existing efforts to create a college going culture for all students. Every high school student will have access to a true “college-ready” culture. By the 2018-19 school year, every student will graduate from high school with an individual college and career plan and have access to resources that will support them in pursuing that plan. 100 high schools are receiving new training and funding to build a school-wide college and career culture. In addition to school-based programs, we will continue to expand on citywide supports for building college awareness and readiness. Every student in grades 6-12 in Districts 7 and 23 will have support that focuses on the whole child, as well as their family on their journey inside and outside of the classroom. Each child will have a dedicated counselor or social worker who will support them through graduation and college enrollment. This initiative will be rigorously evaluated may be expanded to other high-needs districts based on evidence. We have hired approximately 120 shepherds for all middle and high schools in Districts 7 and 23; 16,000 students across 51 schools. The shepherds, who have received rigorous training, will each support approximately 100 students, and will provide academic, social, and emotional supports to ensure students are on a path to success. As we continue innovating, district and charter schools will be paired r with the flexibility and resources they need to meet students where they are. 108 district and charter schools have partnered to share best practices. This includes 11 co-located schools building campus community and sharing practices; 19 schools in District 16 in Brooklyn participating in a district-wide district-charter partnership; and 78 schools in Districts 18, 19, and 23 in Brooklyn engaged in the DOE Uncommon Schools-Impact Partnership. An additional 28 schools will be identified for new collaborative learning partnerships this fall. Ms. Mashel's coverups and harassment will not continue. A Bronx school superintendent at the center of an alleged effort to keep black and Hispanic kids out of a Riverdale elementary school has resigned, the Daily News has learned. Melodie Mashel, the superintendent of District 10, has resigned and will retire on Oct. 1, officials confirmed Thursday. allowed to screen kindergarten applications in the spring. Verdi says the screening was to keep minority and low-income students out of the upscale neighborhood’s school. personnel inside the school during student registration. She was not disciplined for the infraction. Officials wouldn’t say whether the investigation was related to Verdi’s suit. Verdi claims Mashel — at Dinowitz’s bidding — tried to get him fired earlier this year after he complained about the lawmaker’s chief of staff handling private info about applications. Verdi is suing the city Education Department for $14.2 million and plans to sue Dinowitz for $5 million. Mashel could not immediately be reached for comment. privacy of students’ medical and other records. Spuyten Duyvil School (P.S. 24) students leave a special annex at the Whitehall building in fall 2015. The Spuyten Duyvil School’s (P.S. 24) Assistant Principal Manny Verdi says northwest Bronx Assemblyman Jeffrey Dinowitz is seeking to keep minority and lower-income students out of the school, one of several bombshell allegations in a suit he filed on Tuesday against the Department of Education (DOE), Schools Chancellor Carmen Fariña and District 10 Superintendent Melodie Mashel. Mr. Verdi alleges that Mr. Dinowitz’s Chief of Staff Randi Martos reviewed applications for prospective kindergarten students on school grounds from March 25 to April 1 with an eye to preventing minorities and lower-income children from enrolling. 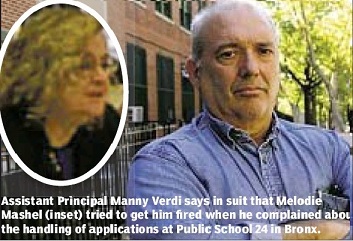 Further, Mr. Verdi claims that since he filed a complaint with the New York City Special Commissioner of Investigation last month, Ms. Mashel intends to fire, demote or otherwise punish him — the latest in a series of alleged efforts by the superintendent to remove the assistant principal. Mr. Verdi referred press inquiries to his lawyer Ezra Glaser. Mr. Dinowitz confirmed that Ms. Martos went to P.S. 24 to help review prospective kindergartners’ applications, but strongly denied any intent to prevent minority and lower-income students from enrolling. Mr. Verdi claims that Ms. Martos’ presence violated the Civil Rights Act, the Family Education Rights & Privacy Act and the Health Insurance Portability and Accountability Act, but Mr. Dinowitz denied that Ms. Martos had access to students’ medical records or anything other than the two proofs of address required to enroll at P.S. 24; Mr. Verdi claimed Ms. Martos was in fact requiring parents to show three proofs of address, which Mr. Glaser described as an intentional extra hurdle. “In a desperate attempt to create a smokescreen to divert attention from the fact that he’s the main reason for the severe overcrowding crisis at P.S. 24, Manny Verdi has brought a lawsuit containing one lie after another,” Mr. Dinowitz said. The assistant principal claimed that Ms. Mashel began targeting him after an Oct. 21 parents’ association meeting in which parents were furious to learn that city authorities had failed to renew a lease for an off-site annex for nearly 150 fifth-grade students. At the meeting, a reporter saw a heated exchange between Mr. Verdi and Mr. Dinowitz, with each man seeming to blame the other for failing to prevent the loss of the lease. Ms. Connelly recently told The Press she felt bullied in the aftermath of the October parents’ association meeting. Mr. Verdi’s suit claimed that since Assistant Principal Andrea Feldman became the interim principal in the fall, Ms. Mashel told Ms. Feldman to fire Mr. Verdi if Ms. Feldman wanted to become the permanent principal. Last week, the DOE announced it was delaying the hiring of a new principal so it could conduct an investigation into the process so far. The department did not specify the cause of the investigation, but it appears Mr. Verdi’s complaints may have been the reason. On Monday night, Ms. Mashel and other school officials met with about 100 P.S. 24 parents to address a recent letter from the parents’ association calling for the speedy appointment of a new principal and an explanation for why the process was halted, among other demands. People who attended the meeting said Ms. Mashel said it could take months to resolve the investigation, outraging parents. “To protect the due process of one or two complainants, on the one hand, against the needs of 1,000 students didn’t make any sense to us,” said PA co-president Bob Heisler. Parents also were worried about the fate of next school year’s fifth-grade students. Since P.S. 24 lost the lease for the annex, the DOE is planning to convert the school’s cold lunchroom and three adjacent rooms into classrooms. Work is expected to begin over the summer. Mr. Dinowitz blamed the overcrowding at P.S. 24 — a building built for about 500 students that has a population around double that — on Mr. Verdi. Mr. Verdi’s suit claims that Mr. Dinowitz’s intent to keep minority and lower-income students out of P.S. 24 was evident from remarks in two meetings. 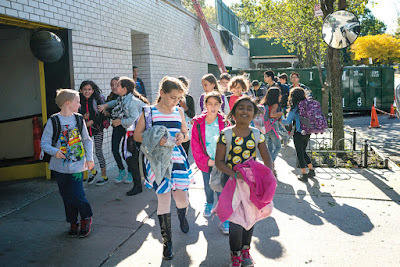 Mr. Verdi claimed that in one, in 2009, Mr. Dinowitz said “he knows who the children are that are not from Riverdale ‘by the way they walk, talk and wear their pants.’” The assemblyman has denied making any such remarks. Mr. Dinowitz said that when Ms. Martos sought to help P.S. 24 process kindergarten applications in the spring, most families were approved. Asked how many families she may have found lacking adequate proof of residency, he did not know. He also did not know their ethnic background. The student body at P.S. 24 was 45.7 percent white, 37.6 percent Latino, 7.1 percent Asian or Native Hawaiian/Pacific Islander and 7.1 percent black in the 2013-14 school year, according to DOE stats. The suit said Ms. Mashel was scheduled to meet with Mr. Verdi on Wednesday, May 4. While the document said the assistant principal originally expected punitive action to take place at that meeting, on Tuesday, Mr. Glaser said he did not know what will happen. The suit said Mr. Verdi wants damages for interference with his contract and violations of his rights as a whistleblower, but Mr. Glaser indicated it was still possible for the situation to be resolved out of court. “I want to see what plays out in terms of what happens from May 4 and what kind of retribution they might take against my client,” he said. In addition to functioning as a full time principal at a kindergarten - 5 Elememnatry School of excellence, also support Network 104 as an instructional coach. Work closely with principals in supporting and growing implemetation of Common Core Learning Standards as well as providing assistance to principals through the NYCDOE Quality Review Process. All aspects of administrayion and supervision including curriculum design and implementation. Staff Development, teacher & parent workshops. Responsible for fedral/state/city compliance around ESL & bilingual education.